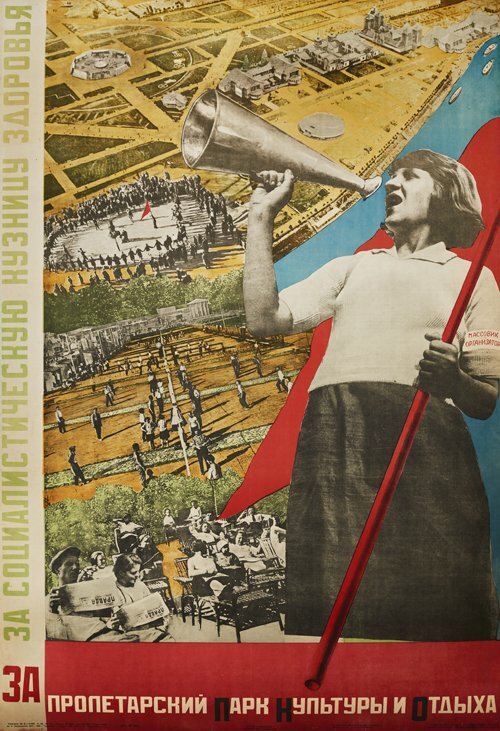 Constructing Revolution explores the remarkable and wide-ranging body of propaganda posters as an artistic consequence of the 1917 Russian Revolution. Marking its centennial, this exhibition delves into a relatively short-lived era of unprecedented experimentation and utopian idealism, which produced some of the most iconic images in the history of graphic design. The eruption of the First World War, the Russian revolutions of 1905 and 1917, and the subsequent civil war broke down established political and social structures and brought an end to the Tsarist Empire. Russia was split into antagonistic worlds: the Bolsheviks and the enemy, the proletariat and the exploiters, the collective and the private, the future and the past. The deft manipulation of public opinion was integral to the violent class struggle. Having seized power in 1917, the Bolsheviks immediately recognized posters as a critical means to tout the Revolution’s triumph and ensure its spread. Posters supplied the new iconography, converting Communist aspirations into readily accessible, urgent, public art. This exhibition surveys genres and methods of early Soviet poster design and introduces the most prominent artists of the movement. Reflecting the turbulent and ultimately tragic history of Russia in the 1920s and 1930s, it charts the formative decades of the USSR and demonstrates the tight bond between Soviet art and ideology. All works in this exhibition are generously lent by Svetlana and Eric Silverman ’85, P’19. This exhibition is on view at the Bowdoin College Museum of Art from September 23, 2017 to February 11, 2018.